Slim extreme weight loss pills contains a proprietary blend of natural ingredients designed to lose weight, suppress the appetite, increase stamina, increase energy, Improve mood and Improve mental focus. Slim extreme weight loss pills contains 10 of the finest natural weight loss herbs, available in a unique, naturally formulated, synergistic blend that’s guaranteed to be safe and effective to lose weight for people who have not been able to lose weight with other diet products. 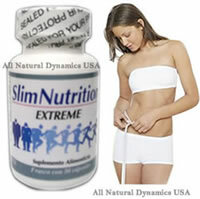 Slim extreme weight loss pills is designed to suppress the appetite while you work out to shed unwanted pounds. The combination of these ingredients work together to help you lose excess weight, help your body burn fat, increase digestion, and increase your metabolism. Where is Slim Extreme Made? How Does Slim Extreme Work ? It basically tricks the brain into thinking that you’re full. The chemical ingredients in Slim Extreme weight loss pills work within the satiety center of the brain by releasing a chemical compound similar to glucose but much stronger. The hypothalamus in the brain receives this signal as an indication that enough food has been consumed and this in turn stunts the appetite. Q: How many capsules of Slim Extreme should I take? A: Most people have positive results taking 1 - 2 capsules an hour before each meal with a large glass of water. If you frequently crave a midnight snack, an additional capsule in the evening might help to curb those late-night cravings. Q: What are the main ingredients of Slim Extreme ? It stimulates the metabolism and reduce body fat to help build lean body muscle. Herbal appetite suppressant with fat-burning properties. It burns fat, boosts metabolism and increases exercise endurance. It increases the body's resting metabolic rate and encourages the release of stored fat for energy production. It increases the activity of thermogenic ingredients by elevating energy expenditure and promoting fat metabolism. It suppress hunger, it aids in the digestion of food, and act as a diuretic for weight loss. It speeds metabolism,breaks down fat, freeing fatty acids which are immediately burned. It is critical in the metabolism and synthesis of carbohydrates, proteins, and fats. It reduces fat mass, increases muscle mass, and reduces physical fatigue. Q. What sort of Weight Loss I Can Expect with Slim Extreme? A. Losing weight can be made quite simple. Reduce caloric intake and increase exercise. Slim extreme weight loss pills can be a weapon in your arsenal in the fight to stay lean as it may help to reduce hunger cravings which will lead to less caloric intake. We believe the best regimen available is one which involves cutting out junk foods from fast-food restaurants and eating more fresh fruits and vegetables and lean cuts of meats. Of course lowering carbohydrate intake helps immensely as well. If possible, try and increase water intake as well, as it helps to flush your system and increase metabolism, enabling quicker fat loss. Try walking 1-2 miles per day. Walking is one of the most effective forms of exercise and is low impact for most people. These suggestions, along with a daily intake of Slim nutrition extreme, will enable practically any person to achieve their goals and dreams of a leaner, healthier and more attractive figure! This product is not intended for use by anyone under the age of 18. Do not use this product if you are pregnant or nursing, have a high blood pressure or have heart problems. You should consult a health care professional before using this product if you have heart disease, thyroid disease, diabetes, high blood pressure, psychiatric condition, difficulty in urinating, prostate enlargement, or seizure disorder. Take 1 capsule with a glass of water, 30 minutes before your first meal. Exceeding the recommended serving of 2 capsules per day will not improve results and may cause serious adverse health effects such as insomnia . Discontinue use of Slim extreme and call a health care professional immediately if you experience rapid heartbeat, dizziness, severe headache, shortness of breath, or other similar symptoms.